A blue kitchen will be visible from this room, so I do want to tie in that color. This is an inspiration-y mood board kind of thing to show you what I’ve been thinking of, so things will change a little. I mean, I’d love that light, but not $6759 worth of love. The couch will be our big ticket item. Just curious, does your husband has an opinion on house decorating things? Mine does, which is good because I have a design enthusiast confidant, but not so great when he disagrees with my choices. I imagine my husband would not be thrilled about the idea of a pink couch. That being said, I liked the right from center coral-y red swatch you posted on fb, I feel like that’s bright and interesting but not super pinky pink. He does – I run ideas past him on things like a pink couch before I would post here that I’m considering it. I want him to be comfortable in our home too! He does reign me in when I get too crazy, but I’m lucky that he usually likes my ideas. The pink couch in blue. I’d do blue because I think it leaves more options open as your style evolves in the new home. Whichever you decide- be proud of it and don’t look back!! Definitely the last couch in either pink or blue. I have to say though, you’ve got the style and personality to pull off the pink. Oooooh I do love that pink couch, but I’m not sure it’s the color so much as the shape and the luxurious texture. If the couch will be your big ticket item, I’d go with blue. Blue, especially in the shade you’re looking at, will go with almost any color. That gives you the freedom to redecorate with a bit more ease later down the line. Plus the pink is so vibrant that it pops of it all around the room will really draw your eye throughout the space more than small doses of blue. Whatever you choose, I’m sure it will look awesome! That’s something I was thinking, too. When you put pops of pink, they really do ‘pop’ and you read it as being more present than it actually may be. Blue it’s the new pink! Ok, I like the shape of the blue couch better, but the pink color. Casting my vote for blue. I like the idea of a blue couch because it can be decorated more ways than a pink one. I dunno, I feel like more stuff would go w/a blue couch plus I like the style of that one better. BLUE. Family friendly with out compromising on style. Knowing your decorating tendencies, I’m guessing there’ll be plenty of pink throughout the rest of the house. I’d go with the blue! True, but I feel like there will be less of it in the new house. I don’t love the blue couch, but I do love the pink one — both the colour and the style. That said, I’d be more enthused by a more ’50s pink — like the coach in the bubble! I cannot wait to see what you pick because I know it’ll look great regardless! Blue. That way you can accessorize with pink more. If you bought the pink couch you would be in danger of having TOO MUCH pink (there is such a thing). I can’t wait to see which one you choose. Please, please share how you plan on keeping it clean/nice with two little ones. We are couch shopping, too and I am trying to make a wise choice with our young son in mind. Thanks! Our current beige fabric couch has held up well, and we haven’t done anything special. We clean any spills right away with whatever spot cleaner we have on hand, and try not to eat/drink much on the sofa anyway. I vote blue! I hope you can get the one you have been eyeing at Anthro. The blue couch with pink accents is gorgeous! Pink, pink, pink, pink, pink! Forgive me, but I felt a need to be heard above the roar of the blue. I think the pink couch is lovely and blue is just, well, blue. I definitely prefer the blue couch but, if anyone could rock a pink couch, it’s you! Is there a lot of blue in the kitchen? I would say pink sofa with blue accents so there is consistency in the flow of colors, but each room retains it’s own personality. Blue and pink look great together. :) But if I had to choose, I’d go mostly blue with pink accents. We had the most amazing sofa in what I would call a vibrant raspberry color for many years. Loved, loved, loved it and still miss having that color around me every day! It was so fun and such energy with it. We moved and it just didn’t work in the new house, so had to sell it. I loved the material as well (it was a really soft chenille) so I would heartily recommend the color for you. Go with what you truly want! 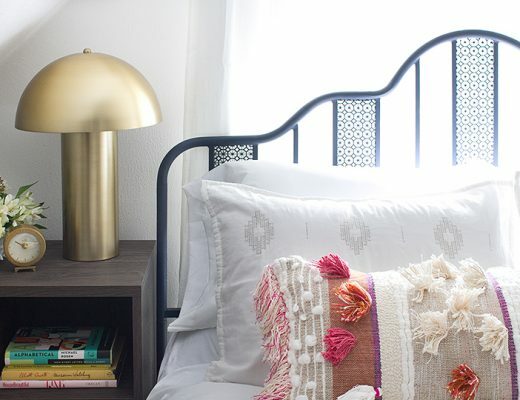 Love that gold suzani pillow. In fact, I bought it last year at Jayson during an intense pillow acquisition phase! It’s on my black mohair sofa, which basically looks midnight blue most of the time. It’s basically dreamy with blue, as you have figured out already. My whole scheme is basically brass & blue, so I don’t think I need to tell you which camp I fall in… though I must admit I love that pink English roll arm too. It will be stunning in your new place, on your new sofa, regardless of the color you decide to go with. I love brass and blue. I love brass and pink through too, so that doesn’t really narrow it down much! I think I’m going to need that pillow though for sure. It looks really good on your sofa, too. That pink is better in person. A little more muted. While the blue, I think, is brighter in person. You’re probably right. Everything is approximated with my good friend, Photoshop! I know you always love pink but I wonder if it would feel dated more quickly than the blue one? I do like the shape and the tufting on the blue significantly better and I always feel like blue can almost be seen as a neutral which would be easier to accessorize around (and change up) than the pink might be. Plus the fact that you’ve already been eyeing the blue one for months and still love it is a good sign that will keep loving it. Yes, the pink one is a new contender, whereas I’ve been a little obsessed with the blue one forever now. I can see being happy with either long-term though! Go Pink! I like this couch because it has NO back cushions and only 2 seat cushions. It’s a gorgeous shade too! 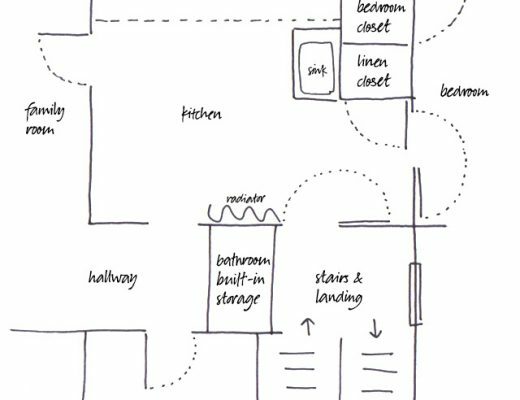 No matter what you decide, I know that your new living space will look SO FAB! I can’t wait to see the new house BEFORE and AFTER! A lot of work ahead, but it’s SO EXCITING! I do like the tight back. Back cushions always seem to get rumpled and lose their shape, and they’re a bit of a hassle. My mom has a blue couch so that would be my vote – you can pair so much with it and I love the pink! Both are great, but I really love that shade of blue! I know! Don’t get me started — I want to commit to a color and go with it. Maybe Kelly green can go in another room. Wow, I hate to say it. I am Team Neutral for a couch, I really am. But I trust your judgment, and can’t wait to see how this plays out. And I can’t wait even MORE to hear about the new houuuuuuuse! I was on team neutral when we bought our last house, and I still would be for most people. I feel good about going with a bold color though! And I can’t wait to share more about the new house! I guess I’m being a little silly, but it makes me nervous to share while there are still contingencies. Soon! Go Pink! It’s timeless, colorful, and classic looking. The blue one risks being on the, dare I say, Pee-Wee Hermanesque side. I think it’s the buttons that do it to the sofa. The buttons are my least favorite part. I loooove the Morgan Sofa. Too bad it wouldn’t survive a day in my place. Kids and dogs are too messy for pink velvet. For about any fabric actually. But they’re so fun to be around it’s worth it. That’s what I wonder about with velvet, though people have been claiming it’s great for kids. Our dog doesn’t go on the couch, but our cats do — the fabric swatch seems to be resisting fur though. Choice 2 – Pink couch in blue velvet fabric. blue! it just looks better. and i think it’s more forever than the pink couch. West Elm used to have a similar light fixture for much less, maybe you could find it on ebay? I remember those! I like the grand scale of the one above though. Eight feet wide! That’s some fixture to live up to. I vote for pink, because it is more your style. I really love the blue! I’m thinking it would be much more versatile. I adore the pink one! It would look sooo good against a dark charcoal wall. Which one is more comfortable to sit on? This is the most important criteria for me. I prefer the look of the pink couch but I would pick a neutral color and save the color for the accents in the room. Also, with kids I would pick something that is easy to clean and hides stains. Can you tell I am practical? They both feel great. They make our current sofa pale in comparison, and I’m looking forward to having a deep, comfy couch to curl up in with a book or a magazine. I’m practical when it comes to easy-to-clean and stain-hiding, but not color. Stopping by and wanted to say how much I love your blog. You’ve got a great eye for color and design. You graphic design is amazing too! Blue and white wallpaper that I like and will be keeping. PINK! Yay for pink! You will always love it. I think you might get sick of pink… I say blue FTW! I’d go in a slightly different direction. The blue sofa with the plum wall from the dining room. (Maybe a brighter shade, that is too dark.) Mostly blue accents, and just a punch of pink like the pink starburst pillow. I’m really feeling the love for plum & blue lately. Definitely the BLUE! I love the shape and the color, and so much more versatile. The blue is nice… But so many people do blue. I say go for pink. It is the bolder choice. And if you can rock it, then rock on. Not to mention that there are a ton of crazy cool blue rugs and pillows to tie the blue in. Oooh, nice finds. Each color would provide an entirely different look. I’m curious to see which you choose! Does this mean we might see a black wall in the new house? Eeeeeeeee!…? I’ve been thinking about it! Maybe not black, but an inky charcoal color. I just painted a wall a dark slate-y teal colour and I am totally in love with it! I am team blue, too. I love the beautiful range of pillows available in pinks, and they would be beautiful on a blue sofa. Just saw a blue leather Chesterfield in the Home Decorators Collection catalog that reminded me of you…. We are all so excited to see what you decide! 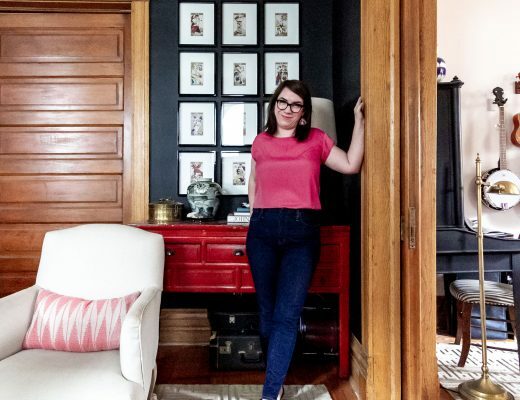 Ooh, I just recently watched a rerun of Emily Hendersons show and she did a dark teal room with berry colored accents. It was Ah-mazing. I think it was called something like “California Cool”. 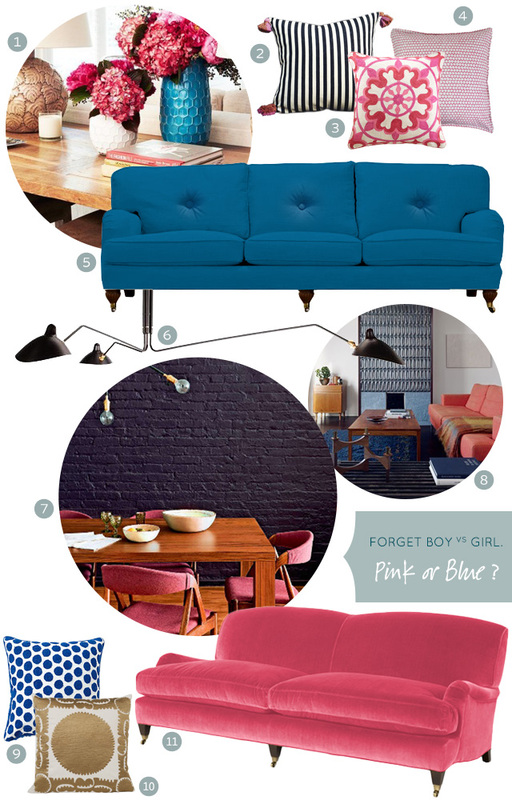 This mood board has the same feel to it – totally loving the blue + pink when done right and I really like the color of that blue sofa! Hi! I picked out a similar rolled arm sofa in teal a few month ago and it’s now sitting pretty in our little studio. Great choice! We love our sofa and love the color even more, it brings life to the space.